I don’t know how I accumulated so many boxes of Christmas decorations. I feel like every year I find something adorable I just can’t resist, but absolutely do not need…so obviously I buy it. I decided this was the year to put a stop to the endless purchasing of decorations, mainly because we are seriously running out of space and to utilize that freed up space with Christmas crafting decorations. There is one type of decorating I’m a total sap for, and that’s child created decorations. 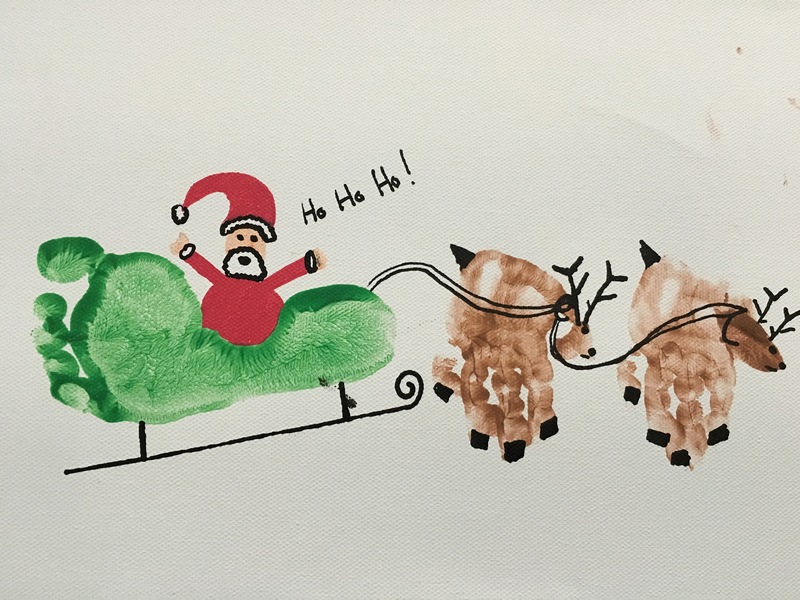 Handmade ornaments, Santa’s with cotton ball beards, popsicle stick Christmas trees…I can’t get enough! I think these remind me of my childhood, and there is nothing more magical than Christmas as a little kid. 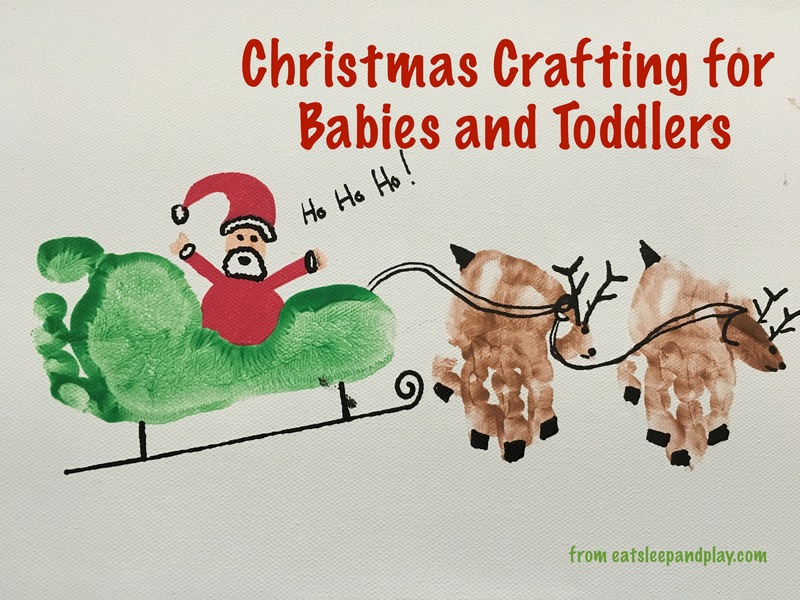 Currently the girls are at an age where they can’t do a ton of creating on their own, but I sure can use their sweet little hands and feet to help me create adorable holiday themed art! I love hand and footprint art for babies and toddlers because its truly amazing to see how much they grow in a year! Last year Layla made a handprint ornament, and its crazy to see how much bigger her little baby hand has gotten!! Also check out or post about Christmas tree painting! I’m going to pat myself on the back for this years craft, because it is freaking adorable. I have not one single picture of the girls making this with me, because as you can imagine having a toddler foot and baby hand covered in paint leaves no free Mom hands to take pictures. Take your child’s foot and cover it in paint. You want the big toe towards the top of the page, I used Layla’s left foot and placed it on the left side of the canvas. We choose green paint for this, but any color would work! Next cover your child hand in brown paint. For this portion their hand will be facing down, and you want their thumb away from the footprint, so I used Olivia’s right hand. Leaving a small space, a put two handprints on the page. Once the kids are done with their prints, your work begins! 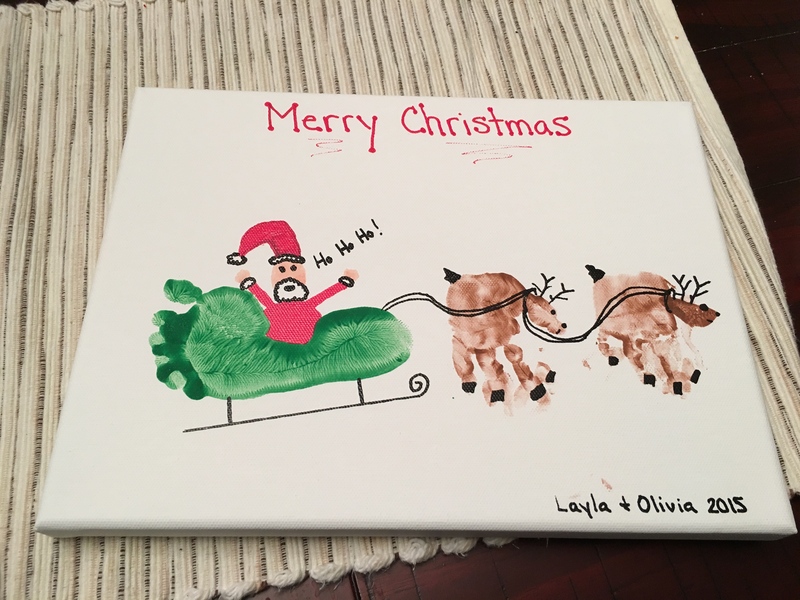 I used Layla’s footprint to create Santa’s sleigh, and Olivia’s handprints became reindeer. Make sure to date your picture so when you look back at those tiny little prints in fifteen years (when they’re driving you insane) you remember exactly how old they were! Did you do any fun Christmas crafting activities this Christmas season? Let us know in the comments below! Aw this is super cute! We just finished something similar today. I added my kids’ mistletoes to aprons for their grandmothers. I was tricky getting my 2 month olds’ foot on there since she’s so wiggly, but I think it came out cute. I love yours!